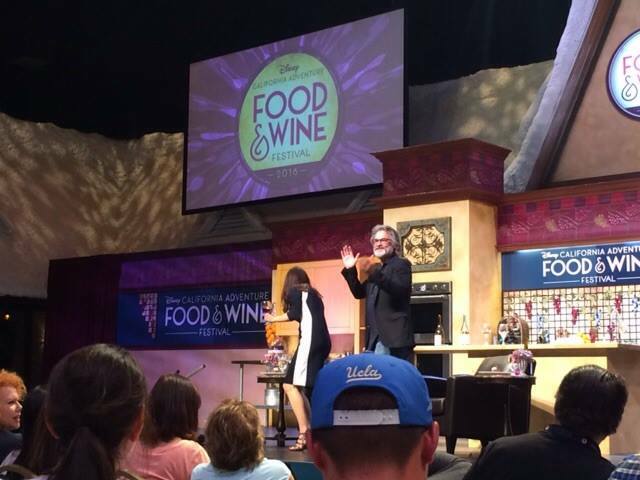 Disney California Adventure's Food and Wine Festival is in full swing. Celebrity chefs, winemakers, brew masters and distillers appear every weekend for seminars. I was originally scheduled to be working on an office project but it got pushed. 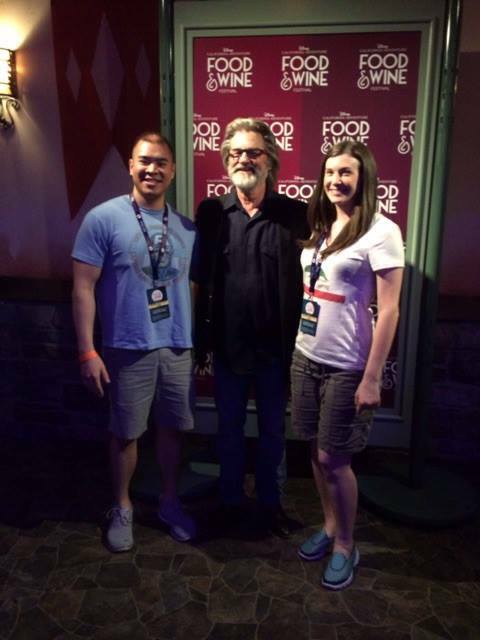 The first thing that came to mind was that I could now attend A Conversation with Kurt Russell, a 90 minute get-together where the fan favorite actor would discuss his career in movies along with being an apprentice winemaker with line Go Gi. Stage 17 in the Hollywood Back Lot was set up with tables and chairs, linens and silverware. Before long, the Disney Legend took the stage and sat down for a fun, funny and informative 90 minutes. Russell of course, got his start as a child actor and knew Walt Disney. After a stint as a professional baseball player didn't pan out, Russell focused on acting. Making a name for himself and becoming a $10 million man with the likes of Escape From New York, The Thing, Big Trouble In Little China, Tango & Cash, Backdraft, Tombstone, Stargate and Soldier, Russell seemingly took a hiatus from filmmaking in the late 2000's. Taking bike and wine tours with long time partner Goldie Hawn in France, Russell began to appreciate wine and in 2007 while shooting Quentin Tarantino's Death Proof, became interested in making it. Cut to today where Go Gi is a specialty label producing Goldie Chardonnay and Tiger Pinot Noir. We were given a sample of a wine not for sale, that Russell produced one barrel or 20 some cases of, just for his mom. But his mom isn't a lush and ends up giving a lot away. For today's tasting for a couple hundred, his mom parted with 2 cases so our sample was noticeably smaller then the others. While Russell contemplated where to jump in to making wine, a movie poster artist friend challenged him to stop talking about it and just do it. Drafting his sister to run the show, the Russell's are now producing organic and sustainable wine that was served up at The Wine Saloon for 2 years before closing this past week due to a change in building ownership. 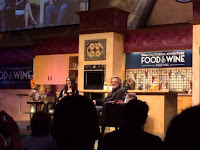 It was a pretty enlightening chat that really showed Russell knows what he's doing when it comes to wine, talking about how temperature, wind, dirt and dew affects grapes and how you want a mix of big ones, shriveled ones, etc. 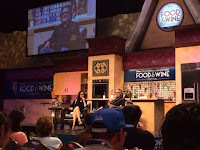 As there are 100's of kinds of apples, there are apparently over 50 kinds of pinot noir grapes and Russell found the one he liked to produce Tiger. Originally Russell wanted to name the brand after a line Val Kilmer's Doc Holliday has in Tombstone, "In Vino Veritas", but it was taken. As was Russell Cellar and a host of others. Wanting to name each vintage after a friend or family member, Russell settled on Go Gi as in Go Gee, because he couldn't pronounce his middle name Vogel as a child. 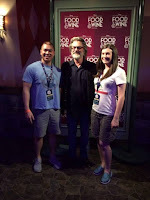 As Russell spoke, we tried wine, ate cheese and fruit then dessert. It was a very laid back environment but well run by the staff. 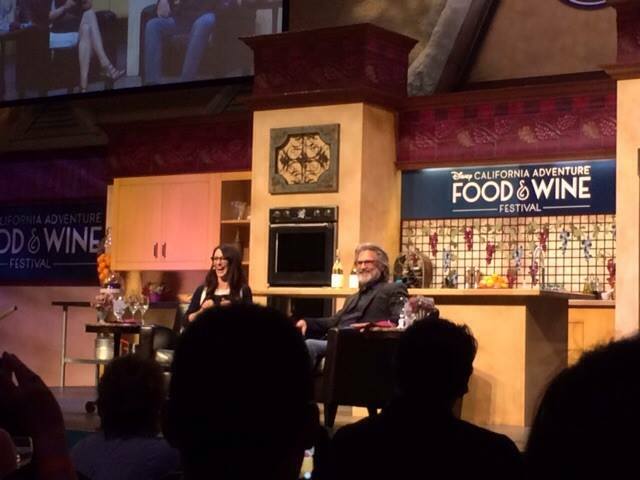 Russell kept things light with his patented sense of humor, down to earth attitude, charmed personality and Kurt Russell laugh as he talked about celebrity couples headed towards splits-ville, the simple pleasure of drinking wine over an afternoon and learning about art when he didn't think he liked it. But when he saw Rembrandt and then the "f*cking Mona Lisa", he got it. 90 minutes breezed by and the moderator tried to close up shop but like at Escape From New York, Russell said shoot him questions fast and he'd answer. He talked about working with then 27 year old Elvis as a 10 year old and recalling 2,000 women chasing after the crooner's car. Also that Elvis was a nice guy who approached Russell's actor father Bing, stating he was a fan and asked if he could wear his hat the way Bing did. Russell played catch with Elvis and usually does with his make-up guy on set. But one guy he didn't play catch with was fellow baseball player turned actor Kevin Costner who Russell refrained from commenting on as he had nothing nice to say. But we all knew Costner was a bit of a jerk, didn't we? I asked what first memories came to mind about Tombstone and after a long pause, Russell stated something along the lines of, "you can keep the 20 years after the film, it was that hard to make but I'm very proud of it. And come on, dude, it's a classic." Russell closed things out explaining that he had just come from the Atlanta set of Guardians of the Galaxy 2 where he was having a great time, speaking highly of Chris Pratt, Zoe Saldana, the cast and was very impressed with writer/director James Gunn who knows what he's doing. He also confirmed that he's playing Peter Quill's dad. When it was all over, Russell stayed and took photos with every attendee, shaking hands and chit chatting. I told him I bought a bottle of Tiger for a dinner party and he smiled and said he drinks it all the time then did the Kurt Russell laugh. It was an awesome day and fantastic experience as it's always cool to see a guy you grew up watching turn out to be a cool f*cking dude.